Well, with our translator search engine, Nakōdo, that’s exactly what we’re seeking to accomplish. We’ve released a new version of Nakōdo today that I’d like to tell you about, but first, let me remind you what Nakōdo does exactly. What is Nakōdo, and what exactly does it do? Nakōdo is a Japanese word that means matchmaker. I don’t know about you, but when I hear the word ‘matchmaker,’ this scene from Mrs. Doubtfire immediately comes to mind… Take a second to let Robin Williams put a smile on your face today. The purpose of Nakōdo is to help clients get introduced to translators who have the highest level of specialisation in a certain field. How does Nakōdo do that? A client pastes in some text from the document they need translated, or something similar. It then analyzes the documents that translators have loaded into their TM-Town accounts. Using the latest in natural language processing techniques, Nakōdo then scores translators with a Similarity Score and Quantity Score. Basically, the Similarity Score is the score of that translator’s most similar document to the text that was searched. On the other hand, the Quantity Score represents how many other documents that translator has loaded that are also similar to the text searched. That means, a translator with fewer documents can have a higher Similarity Score if they have just one document that really matches what the client needs. You’re then free to message the translators Nakōdo introduces you to, letting them know more about your requirements so they can give you a quote. TM-Town takes no cut of any work you hire through the translators on our site, and you’re free to communicate with them however you’d like to. Now that you’ve got a good idea of what Nakōdo is, let’s take a look at the new version we released today! In this latest release, we’ve completely refreshed the look and feel of Nakōdo. We’ve also increased the speed by up to 10x in many searches. That means a lot less waiting, woo hoo! When you first arrive on the Nakōdo page, you’ll see a very simple interface. You can paste some text, and set the target language (notice how the source language is automatically detected for you). After you hit search, kindly wait a few seconds while Nakōdo does its thang (refer to the previous section). While you’re waiting, we’ll also introduce you to a few of our paid Professional Members. If you see someone who catches your eye, clicking on the ‘View Profile’ button will open a new tab. After that, a graph of your results should pop up if we’ve found any matches! 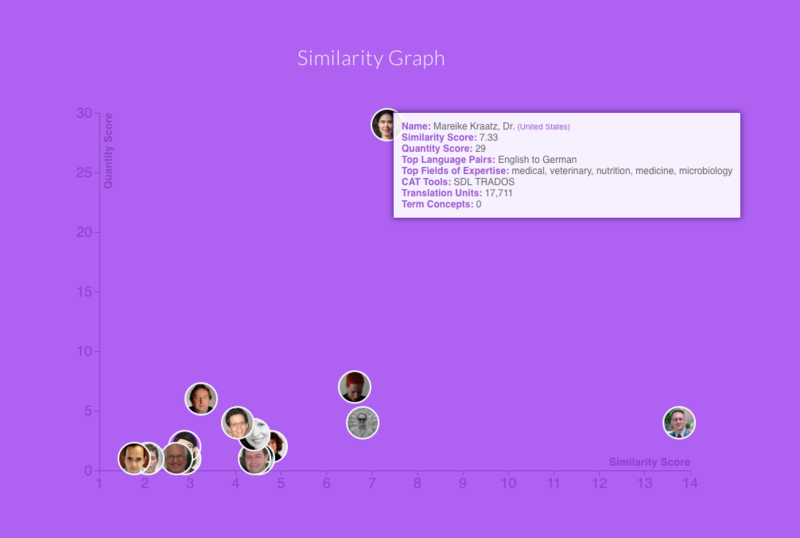 You can see the results plotted by Similarity Score and Quantity Score. Down below the graph, you can see more details about each translator, including the Match Strength (Weak, Strong, and Golden). There’s also a message button so you can easily send messages to each translator you’d like to reach out to. And that’s it! 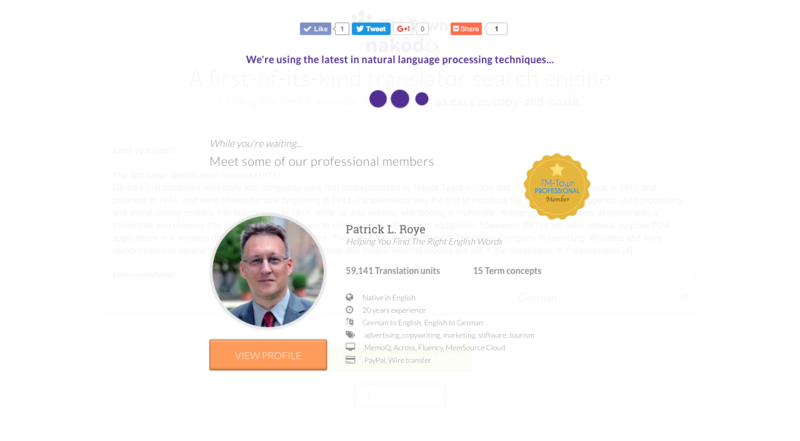 A brand new, shiny, lightning fast Nakōdo that is yet another great tool to leverage when you need a specialist for a freelance translation job. Go ahead and play around with the new Nakōdo, and let us know what you think! It’d also mean a lot to us if you’d take just a second to share this news with your friends. Simply click on one of the share buttons. Thanks!